A couple years back, after Southern California had a small earthquake, I shared how it shook me up (no pun intended) thinking about how unprepared I was to sustain my infants needs in the event of an emergency, like a large shaker. I immediately put together an Emergency Grab and Go Kit for Ryder, who was just a few months at the time, and another for Lou and me. My stomach is again in knots, thinking of all the families effected by the current natural disasters. In the past week, Hurricane Harvey, Hurricane Irma and the 8.1 earthquake that hit Mexico have wrecked so many lives and I cannot imagine the fear and heartbreak that will forever be left with these families. I pray for safety and community at this time. These events have served as a reminder that once again, I am not prepared to sustain my toddler in the event of a big emergency. That bottle of infant formula I included in our infant Emergency Grab and Go Kit would be useless to us now. 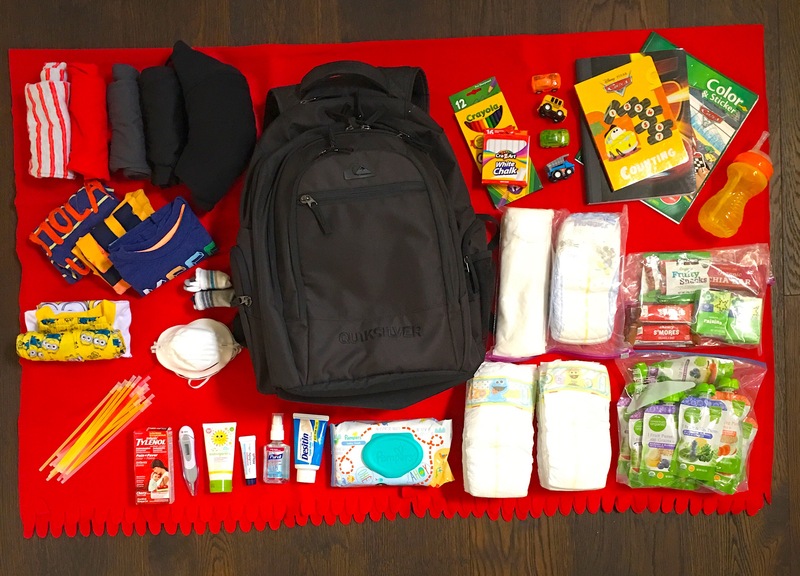 Just to recap on what I shared about in my last post, Earthquake Survival Kit for Babies my childhood home was hit pretty bad when the Northridge earthquake struck in ’94. We lived just a few miles away and the damage to our home was so severe, we had to move out immediately and stay in a hotel for a few weeks until repairs had been completed. Our home was unlivable. The whole city shut down for a few days after the quake – schools, grocery stores and businesses. Luckily, my parents had a family emergency kit and we were prepared to evacuate quickly and escape the aftershocks. This weekend I worked on updating our Grab and Go kit and found this to be the perfect time to stock up. 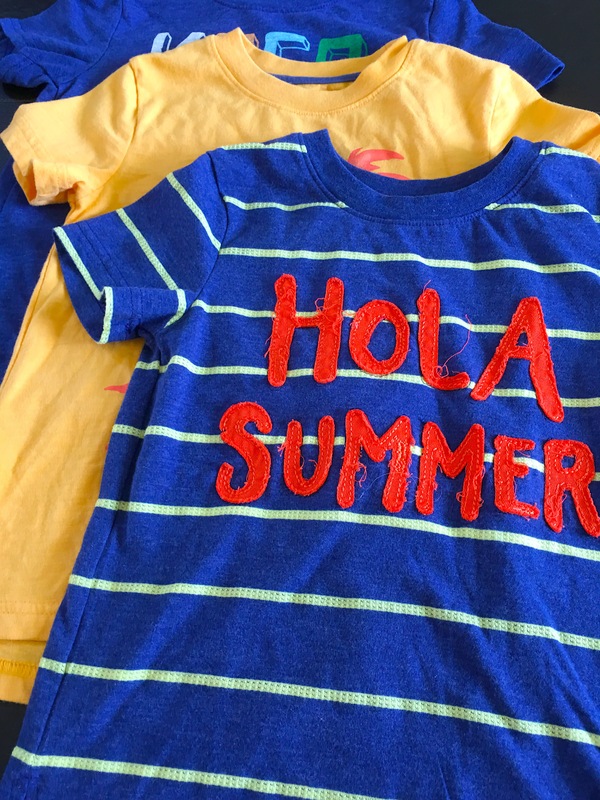 Between back to school sales and the change of season, I found a great selection of sale items perfect for exactly this use. Graphic T’s that reference summer are only a few dollars on clearance at Target and shorts are on clearance for $1.97 at Old Navy. Helpful hint: Rolling clothing compresses them and maximizes space. Back to school sales were also a great opportunity to stock up on some fun activities. I grabbed some new mini cars and a couple sticker/coloring books . I decided to go with colored pencils (and sharpener) and some chalk since crayons melt. Chalk can be used for so many activities. Think hop scotch or drawing tracks on the ground to race toy cars on. It may be a long few days and having fun toddler friendly safe activities can make the whole experience an adventure, rather than a scary event. This is also a great time to stock up on blankets with fall just around the corner. A blanket can be used for many uses. Warmth, a bed, rolled up as a pillow, changing pad, comfort, hung between objects to create shade. I love these IKEA fleece Polarvide blankets. 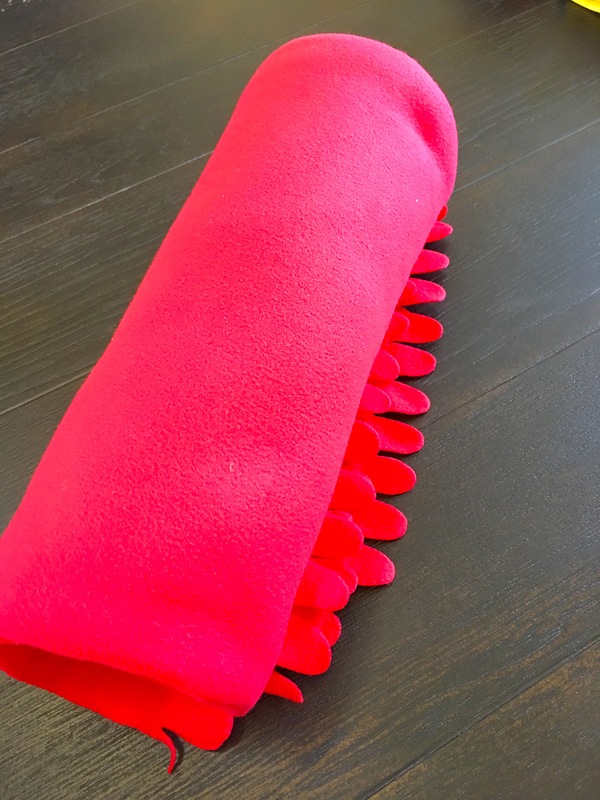 They are so soft, the fleece is great for warmth and they are thin enough that they can easily be rolled up and packed away. Need more room? Use the corner of the blanket to tie on the handle or strap of your backpack. Plus, they are $4.00 so they won’t break the bank. I stocked up on several of these. 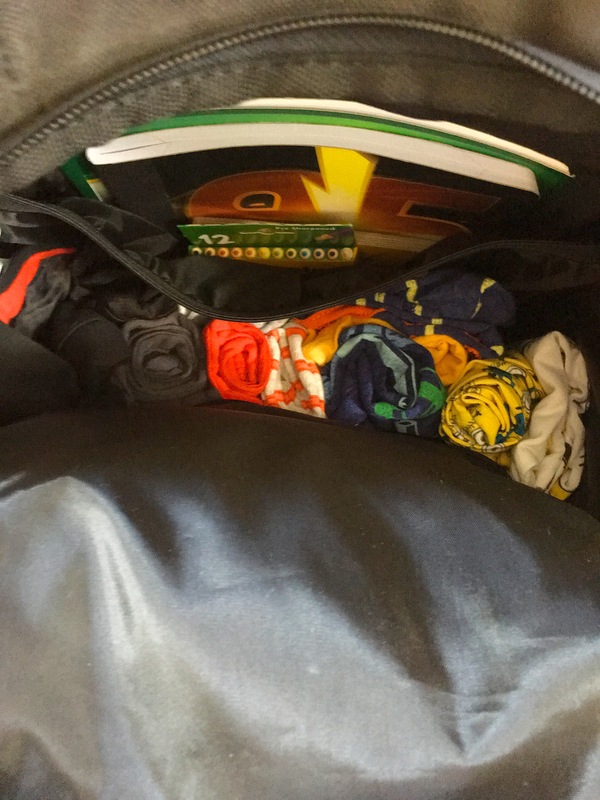 I use them to keep in the car for an emergency picnic blanket or beach towel and keep a few in our family emergency kit, too. You’ll want a giant, good quality backpack to fit everything into. One with many compartments is ideal. It helps to organize packing areas by how you’ll be accessing them. Keep diaper change supplies together, feeding supplies together, etc. Bonus if it has a chest strap to help distribute weight. 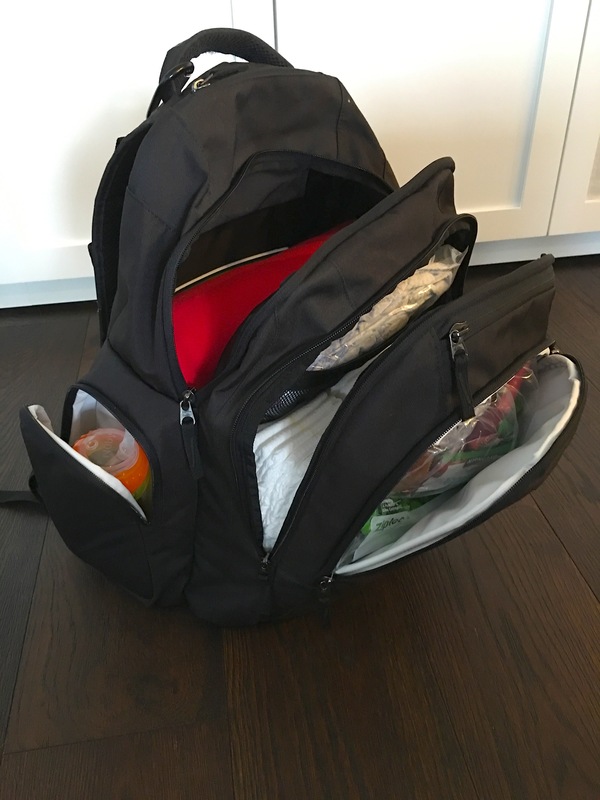 We use this Quicksilver Daddy diaper backpack. In addition to prepping our kit, I also set a reminder in my phone to update the kit every three months with weather appropriate clothing and protection, swap out/check expiration date on food and medicine and check sizing is still appropriate (especially for diapers). I hope this scary and tragic time serves as an opportunity for everyone to review their families emergency and evacuation plan and prepare an Emergency Grab and Go Kit. Here’s a list of what we’ve included in our kit for Ryder. This kit is meant to provide 72 hours of supplies. Please note: we keep a water filtration kit in our family emergency kit, as well as bottled water so I didn’t include any additional water in the Toddler Grab and Go kit. Assess your families needs and plan accordingly. Giant Backpack. One with many compartments is ideal. It helps to organize packing areas by how you’ll be accessing them. Keep diaper change supplies together, feeding supplies together, etc. We use this Quicksilver Daddy diaper backpack. Diapers. 15 day time, 5 overnight, 5 booster pads. Baby Wipes in a Resealable Pouch. These are ideal for diaper changes and hygeine. Diaper Rash Cream. Use it as preventative since you may not have clean water/access to bathing. Clothing. I sized up and grabbed 4T and chose pants that could be easily rolled up without creating a tripping hazard. I figure I’d rather be on the safe side by having clothes be a bit too large, than too snug to fit. Additionally, when I update the kit in the spring, I can swap them out for next size up clothing and he can actually wear the summer attire next year. Non perishable foods. Baby Food Pouches, snack bars, raisins, fruit snacks. I keep these on a constant rotation in our home. I tried to include high calorie foods that provided some nutritional value or could satisfy hunger without using up too much space. When I see a sale on flavors Ryder likes, I stock up and swap out every couple months to ensure the emergency supply doesn’t go bad. I also recommend choosing snack bars that won’t melt. Lara bars are great since most of them are made up of nut/dried fruits and they are often on sale for less than a dollar each so you could stock up in bulk or just make it a goal to get one extra bar with each grocery run. Sippy Cup. Hydration is key here. As I shared above, I didn’t include water, as we keep a water filtration system, water and Honest juice in our family emergency kit. Make sure you prepare proper hydration for all members of the family in your kit. Medicine/First Aid. Did you know that teething has a 65% greater chance of occurring during a disaster than any other time? Ok, I made that up, but having pain relief on hand is always a good precaution. Note your Childs proper dosage for their height/weight and include a syringe or measuring cup for proper dosage. I also recommend stocking your bag with a thermometer, band-aids and a few alcohol wipes. Sunscreen. You may no have shelter so this one is super important. Hat. I’m including a hat in the list to help block out sun, but didn’t include a hat in our kit because Ryder has a meltdown at the mere suggestion he put on a hat. If a child doesn’t like something on a normal day, he probably won’t like it on a frightening day either. Aquaphor. Aquaphor has many uses, but my primary use for it is for chapped lips and soothing sensitive skin. Dust mask. After a big earthquake it could take a while for all the dust to settle. Activities. 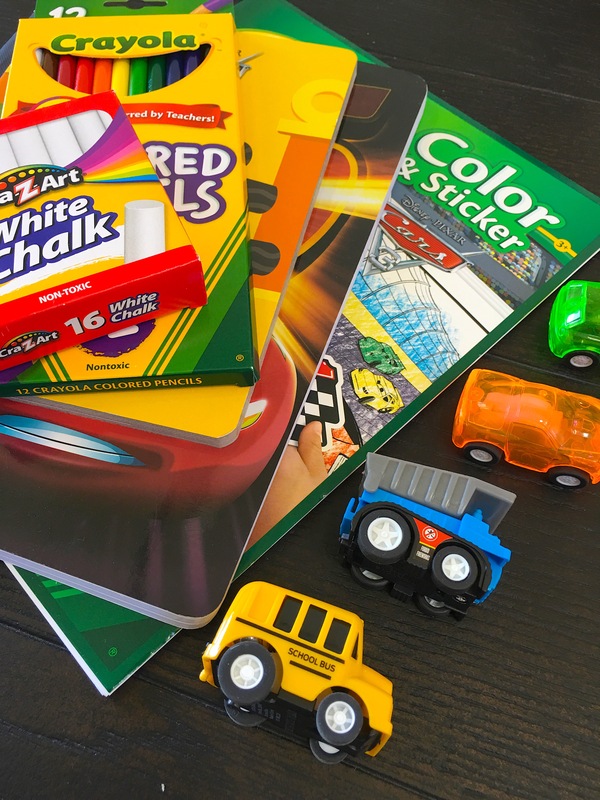 Coloring pencils, sharpener, chalk, mini toy cars, coloring book, stickers, drawing pad. Glow sticks. Snap them to light up and let your toddler have fun wearing these as bracelets so you can keep track of them in the dark. I hope this list serves as a string point for you to put together your own Toddler Grab and Go Emergency Kit. Have an addition that you think I should include in my kit? I would love to hear your input!